Whose wars are being fought on the Caucasus? The confusing picture of economical, ethnic, political and religious tensions and conflicts in the region has recently been convoluted by two films which depict the involvement of parties who are prima facie outsiders. 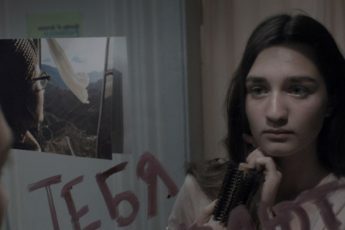 In Tangerines (2014), Zaza Urushadze illustrates the fate of Estonian settlements in Abkhazia endangered or altogether obliterated by the Abkhaz-Georgian war, while Nataliya Belyauskene’s If Only Everyone… (2012) follows a young girl from Russia as she travels to Armenia to retrieve the grave of her father – a Russian soldier – who fell in the Nagorno-Karabakh War between Armenia and Azerbaijan. By focusing on peoples of different origin than that of the main conflict parties, Belyauskene and Urushadze show what it is like to be drawn into a conflict against one’s will, further suggesting that such is the nature of conflicts and wars for civilians both foreign and not: how many of a people want to be at war anyway? Belyauskene and Urushadze grant their protagonists bonding experiences with the enemy even though one would hardly expect that from either a mercenary (Tangerines) or a former army commander (If Only Everybody…). One reason is that the directors make people listen to each other more than seems to be the case in reality (Tangerines at least narrativizes this circumstance through the workings of a saint-like character who forces two enemies to get along after having saved both from certain death). Another is that Belyauskene and Urushadze put up with occasional naïveté to be able to moralize. To many viewers, the films’ lengthy route towards pacifist truisms may seem alienating, but unlike the art-house façade of Caucasian cinema, it communicates authentic exigency; perhaps, such films should really be made in conflict-ridden regions, if not for their cinematic value, then at least for their humanistic potential? Belyauskene’s If Only Everyone… ails artistically because it deals with a delicate subject matter in an unimaginative, over-explicit way. It would be okay to have a girl look for her tragically deceased father’s grave, but why with a frequently lensed birch tree which she wants to plant on it? To complete her mission, she seeks help from Gurgen, an ex-army commander who fought in the war alongside her father. They are also joined by Arj and Mult – from the same military unit -, who argue frequently and thus provide comic relief to the stern but (deep-down) warm-hearted character of Gurgen and naïve and beautiful Sasha (the girl). The road trip complies with genre conventions, often resorting to unlikely plot twists that license philosophical observations by the characters (e.g. “It hurts especially when you are hurt by your own kin”). The script, written by famous Armenian actor Mikael Pogosian, who also plays the role of Gurgen, combines comedy and historical drama, two genres popular with Armenian audiences that have been dominating the nation’s cinema in the past decade. 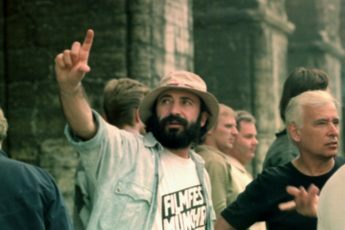 The hybrid allows alternating moments of profound insight with alleviating gags: a prime example is a scene in which Gurgen first has a moment of catharsis where he shares his wartime demons with a priest, then chases down Arj and Mult who fiddle around on an adjacent church wall. The approach becomes transparent over time, but may satisfy mainstream viewers nevertheless – both in Armenia and abroad. Belyauskene and Pogosian cleverly combine the insider’s perspective of the Armenians with that of Sasha, who views Armenia with a foreigner’s eye, but identifies strongly with the country because of her parents. 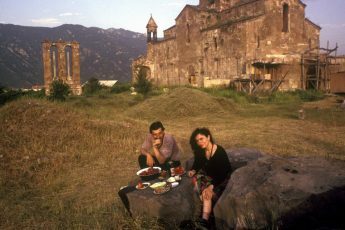 Clearly, a main addressee of the film is the Armenian diaspora: though many young Armenians born abroad have never been to Armenia and/or don’t speak the language, their patriotism is generally considered stronger than that of other emigrant communities. Indeed, If Only Everyone… represents an easy and entertaining way for them to get to know their country better (which may be part of the reason why President Serzh Sargsyan supported it). While being largely generic and devoid of major diplomatic concessions, the film at least tells them that wars harm everybody. For the Caucasus, that is a start.